Getting to the upper floors of buildings with more than one level is, in many countries, a major obstacle for disabled persons, especially wheelchair riders. I (the author) am an advisor to PROJIMO in the village of Ajoya, Mexico, and live on the second floor of a small, two-story cement-block building there. My friends at PROJIMO rightly criticized me for living in inaccessible quarters. But how could the upper-level of my home be made more accessible to wheelchair riders? The entry is via a steep wooden stairway: little more than a solid step-ladder that leans against a rectangular opening in the upstairs floor. A ramp would be out of the question in the small room with so many steep stairs. The only possibility would be some sort of elevator. But a commercial motorized elevator, or lift - even a small one, designed to glide up a stairway - would be far too expensive. Besides, the supply of electricity to the village is too unreliable. What to do? 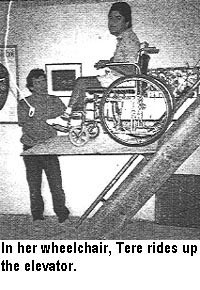 To make the upstairs accessible to wheelchair riders, a visiting inventor from Holland, Reinder van Tijen, together with two disabled craftspersons at PROJIMO, Martín Pérez and Marcelo Acevedo, helped to design and build a simple elevator lifted by gravity. The elevator consists of a plywood platform mounted on a frame of steel tubing. Welded to the frame are sets of ball bearings that roll along a diagonal pipe attached to the stairway. The platform is lifted by a cable that passes through a hole in the cement block wall at the top of the stairs. 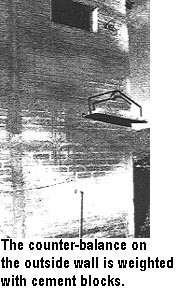 The cable rolls through pulleys, which are made from the front wheels of old wheelchairs, mounted on steel plates and bolted through the wall. The cable is attached to a counter-balance that rolls up and down the outer wall. The counter-balance is weighted with cement blocks, the number of which can be varied so as to match the weight of the particular wheelchair rider. When properly counter-balanced, the elevator glides effortlessly up and down the stairwell. A short diagonal pipe welded to the metal frame of the elevator is equipped at either end with 4 sets of ball bearings. These bearings fit snugly around the diagonal pipe next to the stairs. Another set of ball bearings, attached to the other side of the elevator frame, rolls up and down the edge of the wood plank on the right side of the stairs. The simple elevator worked well. It has now been used by wheelchair-riding visitors for more than 4 years. Since the time it was built, however, visiting engineers warned that the elevator was unsafe. The biggest risk factor, they insisted, was the lack of an automatic locking mechanism to safely hold the platform in place when it reached ground level. As designed, the platform had to be locked by the rider on reaching ground level. 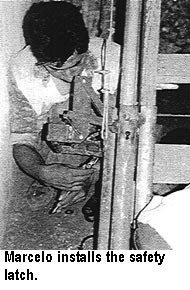 A bolt was slipped through two holes: one in the elevator frame, and one in the diagonal pipe on which the elevator rolled. As long as this bolt was in place before the rider rolled off the platform, there was no problem. But, if he forgot and rolled off without inserting the bolt, the elevator would rocket skyward. This happened once, when a small boy was standing on the edge of the elevator. The platform took off like a rocket. 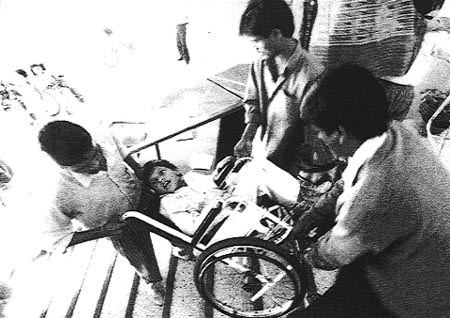 The surprised boy shot upward and fell off into a water tank below. Fortunately, he was unhurt. But if anyone had been on the stairs when the elevator rocketed upward, heaven help them. An automatic parking brake for the gravity-run elevator. Although visiting engineers insisted that the elevator needed an automatic locking mechanism, none offered a design. 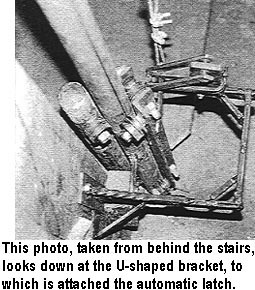 Finally, it was Marcelo, the disabled PROJIMO craftsperson, who designed and built a fail-safe automatic locking mechanism for the elevator. He made it out of scraps of iron bar, a spring, and a few bolts. The device is simple. 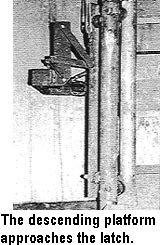 A U-shaped iron bracket is bolted to the side beam of the stairs. To this is attached a V-shaped latch, made by welding flat iron bars. 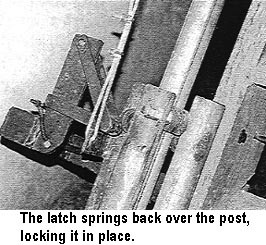 The latch, which pivots on a bolt, is pulled forward by a spring. 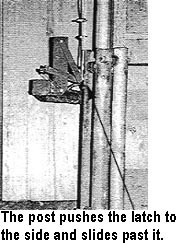 This latch hooks onto an upright post, welded to the platform frame (the post to which the elevator lift-cable is attached). When the elevator comes down, the post pushes the latch out of the way. Having passed, the latch springs back, hooking onto the post and locking the platform at ground level. The device was tested 100 times and appears fool-proof. The only way to unlock the latch is to put enough weight on the platform so that it lowers a bit more, then push the latch out of the way. As an added safety mechanism, the original bolt-lock can still be used when the elevator is not in use - giving double protection. In conclusion: Thanks to the warnings of visiting engineers, plus the creative design and building skill of Marcelo, the gravity-run elevator is now much safer. In many circumstances, ramps are far cheaper and more practical than elevators. The recommended grade (steepness) of a ramp depends on the strength of its users, and whether they have, or need, assistance. 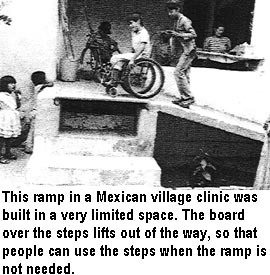 Ramps for public use should have a very gentle slope, so that persons with weak arms can go up them without assistance. But in limited space, a steep ramp may be better than none.